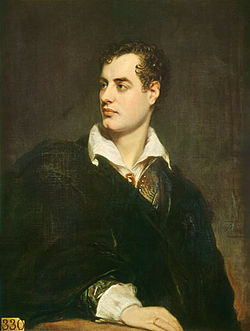 George Gordon Byron, 6th Baron Byron, later George Gordon Noel, 6th Baron Byron, FRS (22 January 1788 – 19 April 1824), commonly known simply as Lord Byron, was an English poet and a leading figure in the Romantic movement. Among Byron’s best-known works are the lengthy narrative poems Don Juan and Childe Harold’s Pilgrimage and the short lyric She Walks in Beauty. He is regarded as one of the greatest British poets and remains widely read and influential. He travelled all over Europe especially in Italy where he lived for 7 years and then joined the Greek War of Independence fighting the Ottoman Empire, for which Greeks revere him as a national hero. He died one year later at age 36 from a fever contracted while in Missolonghi in Greece. However, Nathan, in his reminiscences of Byron, indicates that the subject of the poem may have been….